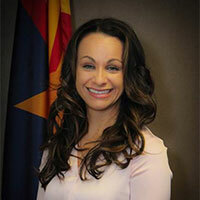 Amanda M. Markham serves as the Deputy Assistant Director for the Arizona Department of Revenue’s Education and Compliance Division; focusing on optimal education efforts, strategic planning, customer relations and agency vision and branding. Amanda has a Masters in Criminal Justice, is a certified Adjunct Facilitator in the Online Criminal Justice (CJ) field, Arizona Certified Peace officer and a Board Member with Angels in Patrol. As a current student in the Doctoral Program for Management in Organizational Leadership, she is also growing within the community and developing leaders with adaptive servitude leadership methodologies. Most notable, Amanda has been on the forefront of change-management in the tax compliance environment – educating, enforcing compliance, laws and implementing continuous improvements. Her contributions include reductions in costs, improvement in efficiencies, and maximized revenues in the pursuit of overall Arizona State government operational excellence. Amanda enjoys running and is regarded highly for her fierce dedication to her family, being a hockey mom and most notably, as a public servant to those around her.